On An Overgrown Path: Copyright - common sense prevails? Copyright - common sense prevails? With regard to existing copyright laws, naturally we hope that common sense prevails when the EU vote on the proposed extension later this year. On Thursday the European Parliament voted in favour of extending copyright protection on music recordings from 50 to 70 years, which is still considerably more lenient than US copyright law. This EU ruling will affect labels such as Naxos Historical as well as Archive Classics. But the fat lady in Brussels hasn't sung yet. Once the law is agreed by member states, they will have two years to put it into place. Which should put the European copyright watershed at around 1942. 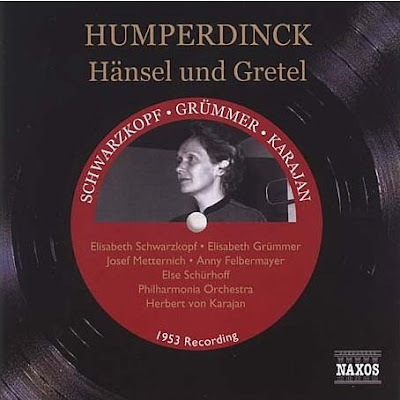 There was a great resurgence of recording activity after World War Two, so that twenty year shift will put a lot of important recordings, including Karajan's 1953 Hänsel und Gretel (seen above) back into copyright in Europe. But, in continuing defiance of common sense, other great recordings will remain out-of-copyright, including Casals' late 1930s' Bach. "The measure must still be passed by individual countries, and even if this is done by this summer, only recordings made in the 50 years before that point will qualify for the extended copyright." Ben, thanks for that clarification. I took my interpretation from the euobserver.com story which says -The measure, adopted by 377 votes to 178 votes, will apply to both new and old recordings. Reading the various reports it seems that not only hasn't the fat lady in Brussels sung yet, but her song is still being written. Sooner or later musicians making a portion of their income from recording rather than performing will be seen as a singularity that happened for a while in the 20th century.